--- --- T The Rideau Canal is a chain of beautiful lakes, rivers and canals winding 202 km from Kingston, onLake Ontario, to Ottawa, Canada's capital city. Tnis is one of Canada's historic canals, the Rideau is maintained and operated by Parks Canada to preserve and present the canal's natural and historic features, as well as to provide a navigable channel for boaters. --- --- T Get a season pass from Parks Canada if you are going to follow Le Grand Circuit Nautique. The locks have restricted hours late in the season, so if you plan to cruise in September or October check on the Parcs Canada website for their hours and closing date. In 2005, the Rideau closed October 12. --- --- T The American Revolution created a hostile country to the south of Great Britain's Canadian colonies. For many decades after the establishment of the United States, Americans believed that the conquest of Canada was a piece of unfinished business left over from the revolutionary war. In the event of war the colony of Upper Canada (present-day Ontario) was at particular risk along the St. Lawrence River from Montreal to Kingston. The river route, vital for the transportation of goods and people to and from the Great Lakes area, was easily cut off because much of the southern shore of the river was in American possession. --- --- T The need to deal with the weakness of this water link to the Great Lakes became apparent when tensions between Great Britain and the United States led to war in 1812. Canada emerged unscathed after the two year war, but there was a clear recognition that something had to be done to resolve the issue of the vulnerable St. Lawrence River route. --- --- T Following the War of 1812 surveys were carried out to identify a second, safe, route from Montreal to the Great Lakes. The decision was to follow the Ottawa River from Montreal to the mouth of the Rideau River, at present day Ottawa, then travel south along the Rideau and through a series of small lakes to the Cataraqui River which emptied into Lake Ontario at Kingston. Unfortunately, the route selected was navigable only in parts and to use it for boats larger than a canoe necessitated the construction of a series of locks between Ottawa to Kingston. Given the expense of such an undertaking, the project met with little enthusiasm with the British authorities, especially since relations with the United States had returned to normal after the war. --- --- T A champion of the building of a canal arose in the person of the Duke of Wellington, famous as the victor over Napoleon at the battle of Waterloo and an influential voice in British politics. The result of his support was the appointment of Lieutenant-Colonel John By of the Royal Engineers to oversee the task of making the Rideau-Catarqui route into a navigable waterway. 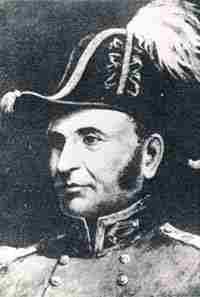 --- --- T Col. By arrived in Canada in 1826 and set up his headquarters near the mouth of the Rideau River. The settlement was originally called Bytown but was eventually renamed Ottawa. 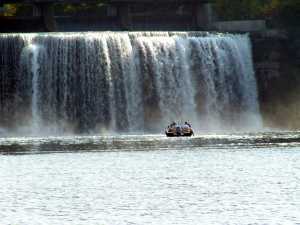 The plan was to build a series of dams and associated locks to connect the Ottawa River with Lake Ontario. Locks were designed, at Col. By's insistence, to be 134 feet long and 33 feet wide. These were large enough to accommodate the new steamboats which were beginning to appear on the Great Lakes. --- --- T Work actually began in 1827. Like the Erie Canal to the south, the construction work was contracted out to private individuals. Most of the locks and dams were built of stone quarried on site, while the necessary iron fixtures were forged by local blacksmiths. --- --- T The labourers who dug the lock pits, hauled the stones, and built the dams and locks were drawn from two main sources. Many came from the only major populated area in the country, the French-Canadian settlements of Lower Canada. Still others were recruited from the boatloads of immigrants - mostly from Ireland - who were beginning to arrive in Canada in ever-increasing numbers. Tragically, new recruits were always needed to replace workers who died from malaria, contracted in the many swamps along the route. --- --- T The Rideau Canal was officially opened in the summer of 1832. It was an amazing achievement. For most of its length of 202 km, the new canal passed through an unsettled wilderness where Col. By and his workers managed to create forty-seven locks, some of them posing a considerable engineering challenge. Because of its military role, the canal also included defences in the form of fortified lock masters's houses and substantial blockhouses at the lock stations most exposed to possible enemy attack. --- --- T Measured against what was accomplished, the financial cost was low: £800, 000. But far from applauding the achievement, the British Parliament of 1832 expressed its shock at the expenditure of such a sum of money and recalled Col. By to face a parliamentary inquiry into his activities. While intensive investigation absolved Colonel By of any kind of mismanagement, he never received the honours his achievement should have earned him. He retired to private life, and died a disappointed man in 1836. --- --- T Although it was constructed as an alternative to the St. Lawrence River in case of war, the new Rideau Canal was more easily navigable than the St. Lawrence River with its series of dangerous rapids between Montreal and Kingston. As a result, after its opening in 1832, it became a busy commercial artery from Montreal to the Great Lakes. But its glory days were short-lived. By 1849, the rapids of the St. Lawrence had been tamed by a series of locks and commercial shippers were quick to switch to this more direct route. --- --- T The Rideau Canal's heyday as a busy national highway ended in the 1850s, but the region it passed through remained ill-served by roads and railways until after the First World War, and so the Rideau continued to be an important local transportation system. It was even enlarged during this period, when the Tay Canal was completed in 1887 to connect the town of Perth with the main Rideau system. --- --- T After the First World War commercial traffic disappeared almost entirely from the Rideau. It was no longer of any value for military, commercial or transportation purposes. All that saved the system from abandonment was the high cost of taking it apart. 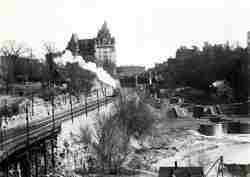 --- --- T Even before the decline of local commercial traffic, a new role for the Rideau Canal had begun to emerge. The natural beauty of much of the area through which the canal passes, along with the promise of excellent sports fishing, hunting and recreational boating stimulated the development of the tourism industry in the area and, by the end of the 19th century, hotels and private cottages made their appearance along the canal. --- --- T The years since then have seen a massive expansion of the recreational use of the Rideau. Further, in more recent times, the historical value of the canal has become recognised. Declared by the Historic Sites and Monuments Board of Canada to be of national historic significance, the canal attracts thousands of visitors every year, anxious to cruise this beautiful waterway and to learn about this remarkable engineering achievement and its role in the development of Canada. --- --- T The Rideau route traverses, geologically, four distinct geologic regions. Each is unique and the cruise experience is thus enhanced by the marvelous variety between the regions. This is described in the section on Rideau geology. --- --- T The Rideau Canal is actually two separate river systems with the Rideau River originating in Big Rideau Lake and flowing north-easterly to Ottawa, and the Cataraqui River starting at Newboro Lake and flowing south-westerly to Kingston. The watershed of the Rideau is much the larger of the two rivers, 4,000 square km, compared to the 910 square km drained by the Cataraqui. The highest point of the canal, at Newboro, is 180 m above sea level. The drop from Newboro to Ottawa is 97 m and the drop to Kingston is 131 m.
--- --- T To create a navigable waterway, the builders of the canal significantly altered the natural environment through which it passed. In particular, the construction of a number of dams and weirs to control water levels resulted in drowned lands along the length of the canal, providing ideal conditions for recreational fish such as largemouth bass. The waterways are home to one of the most diverse fish communities in Canada. The extensive wetland areas have become a rich environment for a wide variety of plants and animals. The canal's wetlands are home to many rare species including 42 rare plant species and rare animals like the small-footed bat. --- --- T Control of water levels to ensure sufficient draft in the navigation channel is vital to safe boating and this is accomplished through a series of reservoir lakes where, in the springtime, water from the winter snows is captured as a source of supply to the canal when necessary. Water management is a delicate balancing act to maintain adequate navigation levels while avoiding harm to the natural environment. --- --- T The World Heritage Convention established a World Heritage List to recognize natural or cultural locations that are globally significant. The List serves as a tool for conservationof the sites. There are thirteen Canadian places on the World Heritage List. The Rideau Canal has been nominated by Canada for this significant global recognition, hopefully for the 175th celebration. --- --- T We traversed the lower half of the Rideau Canal with our daughter and two grandchildren in August 2001. We had a wonderful time. In fall 2005 we traveled the length of the canal while cruising Le Gran Circuit Nautique.